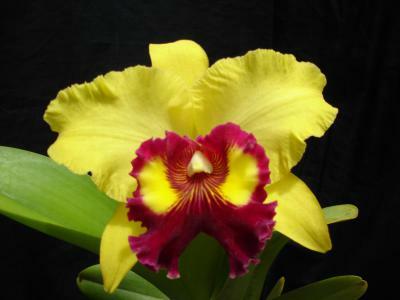 Here at Kawamoto Orchids we specialize in growing many types of Cattleya Orchids in Hawaii. Mericlones Cattleya's, Cattleya Species, Cattleya Crosses, Brassavola, Laelia, Potinara, Sophronitis, etc. Cattleyas are known as the "The King of the Orchids". They are best known for being the classic corsage orchid. Cattleyas are an excellent choice for beginners. Due to their relative ease of culture and adaptability to many different environments. 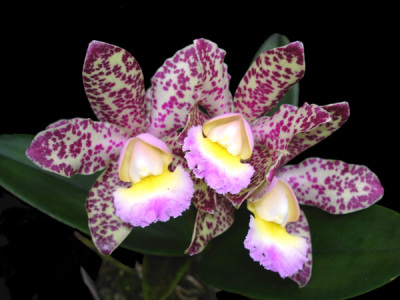 Cattleyas are among the most popular orchid genus grown. They produce breathtaking fragrant flowers an are available in a wide range of spectacular colors, sizes, shapes, and textures. Light- Cattleyas grow and flower best with strong, filtered or indirect sunlight. The most common cause for failure to flower is insufficient light. Growths and flower spikes should develop straight and strong without the need for staking. Foliage color should be medium olive green. If the growths are weak and floppy, and the foliage a very dark green, the light is probably insufficient. If the foliage is more on the yellow side and quite hard, the plants may be receiving too much light. While it will flower, the plant is probably being stressed and will not perform to its optimum. In the home, cattleyas prefer either an east or a lightly shaded south-facing window. West windows should be used with caution. Depending upon the location of the home, the west window may become very hot during the late spring through early fall. Watering- Depending upon your temperature, Cattleyas should be watered about once or twice a week. During the summer, the plants may need to be watered every 3 days. The simple rule of thumb for watering should be as followed : The hotter the days, the more watering is needed, the colder the days are, the less watering is required. Cattleyas may be allowed to dry out between waterings. Try to water the plants early in the day (morning), so that the foliage can dry off during the day. Give the plants ample air circulation to help dry the leaves. Temperature- Cattleyas adapt to a wide range of temperatures. Provide nighttime temperatures 55 to 60°F and daytime temperatures 70 to 90°F. Plants can tolerate temperatures of up to 100°F, if shading, humidity and air circulation are increased. 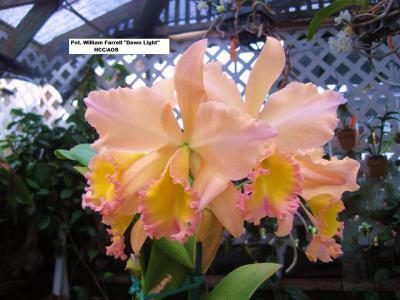 Most cattleya can tolerate low temperatures into the low 40's for short periods of time. Humidity- A range from 40 – 60-percent relative humidity is recommended. While relative humidity is naturally inversely proportional to temperature, the reverse is needed by cattleyas. That is, the humidity should rise with the temperature to prevent the plant from being stressed by transpiration. In greenhouses, under-bench misting activated by a humidistat is a practical solution. An alternative is to spray the walks and benches with water. In the home, place plants on a grid over a water-and-gravel filled tray, or mist them daily. Fertilizer- Any balanced orchid fertilizer (look at the numbers on the container, 20-20-20, etc.) can be used to fertilize your orchid. Feed weakly (¼ strength) weekly works well for catts. Once a month use clear water to flush any accumulated salts from the potting mix. Increase the fertilizer to ½ strength when the plants are in active growth. Potting- Cattleyas should be grown in Medium Orchid Bark. The bark mix should be moderately coarse to allow for free drainage. Cattleyas should be repotted once every two years. Ideally, Cattleyas should be repotted in the spring.